We had a fun Spring Break time in Dallas. Every spring break in the past we would always go out and have an adventure somewhere. we've taken trips to Florida, Austin, and last year we went to Hawaii. I love going out of the city on breaks and explore the different parts of the country. So this year we stayed local and I wanted to make the best of it. 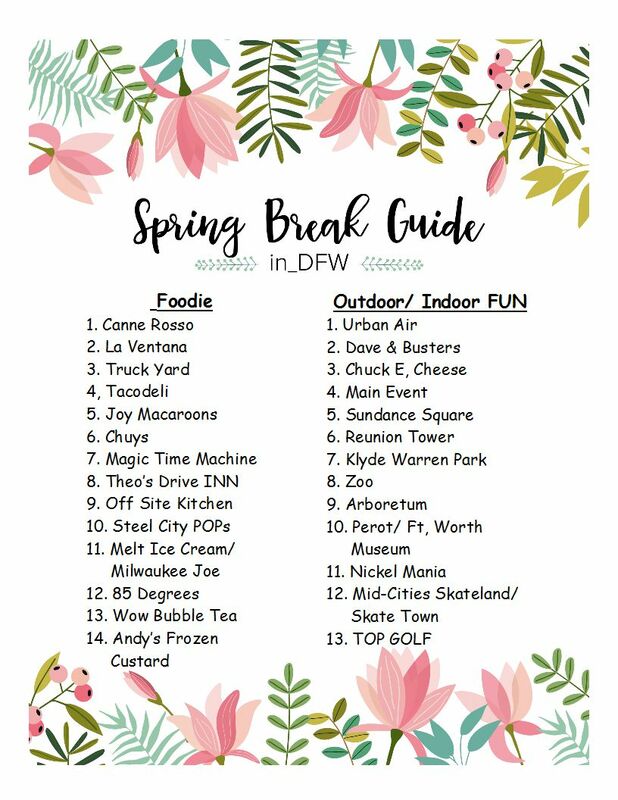 I created a Bucket List that I can use in the city of Dallas and share it with other families that are local. So I wanna share my top 5 ways that we survived spring break in Dallas. When we planned ahead we were happy. I planned a week of events on my Happy Planner it made the week survivable. I encourage my kids to pick the places that they wanted to visit off the list that I created. This helped the kids choose what they wanted to do and we stuck to it. It validated that the choices they choose were good and that we were going to them. The one place they wanted to do was chuck E cheese and we didn't get to that. Which leads to number 2. What do I mean by that. I wanted to avoid places that I knew would have a lot of kids and make the experience not as enjoyable. We went to Klyde Warren Park and that was a crowded place at the children's park. We planned ahead and avoided the food trucks because the lines were super long, so we ate at Relish. Its right behind the savoy resturant and there was no line. I really liked that we knew that place would have a minimal line. We also bought our little blanket and set out a picnic on the lawn. We rented the games and played and just relaxed on the lawn. 3. Hang out with other moms. Going to places with friends makes the outings that more fun. I would invite my sons friends to play at the park with us one day and the next day go out with my mom friends. Those outings made it that more fun and the kids are entertained with their friends and you can have adult conversation as well. I really like sharing memories with my friends. Jut remember to go with friends that like the same interest and its not as stressful. I really like to take pictures with my DSLR and my iPhone. Its been great to document with the pictures we take and look back at the memories. I have a subscription to chatbooks. Chatbooks takes your pictures from Instagram and prints them into a soft cover book. It makes if fun o not worry about printing the pictures. I also bought a mini tripod and that encouraged me to get in the pictures as well. Get yourself one and you wont regret it. What we also did was buy our oldest son a disposable camera that he could use for the break and take his own pictures. It was nice to see him with his own take of what he liked on his break. I haven't developed the pictures yet and I cant wait to see what he captured. I know I talked about taking pictures, but take one or two and put the phone away. I am guilty of checking my phone all the time and its not good I can admit that. I can see my kids begging for my attention and I am not paying attention to my kids. I needed to take a Break from the phone as well. This was hard am not going to lie, but you know what, when I did we had fun. I took my kids around Ft. Worth, ate at some great places and took wagon rides around the block. I made sure that I stayed in the moment and be present. This was my challenge to have a break from my phone and relax with the kids. I think I did that and we made the best of our spring break in Dallas. I hope that these 5 tips help you when you are going on break with your kids. We love to travel and where should we go next. Please leave a comment below of where we should go next. We want to go to west Texas and visit Big Bend sometime.